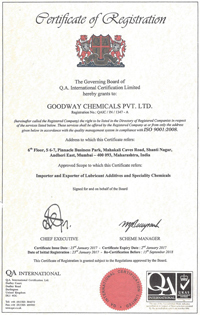 Owing to our sound industrial experience, we, Goodway Chemicals Pvt. Ltd., would like to introduce ourselves as a leading Trader and Exporter of the chemical industry. In the year 2007, we embarked our journey and have attained several accolades in this one decade. Our offered range that includes Petroleum Sulphonates, Sodium Petroleum Sulphonate, Lube Additive Components, Lube Additive Packages, Fuel Additives, Lubricant Additives, Corrosion Inhibitor and Speciality Chemicals have also become popular in the market because of its fine quality. Pharmaceutical, cosmetic, adhesives and petroleum are some common industrial sectors in which our products find their application. We constantly receive bulk orders from these sectors from around the globe and we leave no stone unturned to ship the products on time to them. Dubai, Iran, Gulfs and Singapore are amongst those few countries in which we export our products and always receive positive feedback. We work towards achieving maximum customer satisfaction as that is the foremost objective of our organization. We have our clients in domestic and international market both and to promptly reply to queries we have appointed a dynamic client serving team. They not only help in maintaining transparency between us and our clients but also help us in understanding each other requirements. We keep transparency and fairness in business dealing.